eco-flo has been formulated with super concentrated seaweed extract to make the range more bio-active. Calcium is absorbed behind new root tips so the added seaweed extract (which encourages root development) increases calcium uptake. It also reduces plant stress and improves soil structure. The eco-flo range are all liquids so they can be put through trickle irrigation, centre pivot, boom sprayers or even applied by aircraft which makes the eco-flo range much more user friendly and versatile. The eco-flo range is manufactured using a patented suspension technology providing peace of mind that the product will remain stable long after other formulations have set hard in the bottom of the drum. OCP HUMIC 18 is a high concentration Potassium humate liquid. 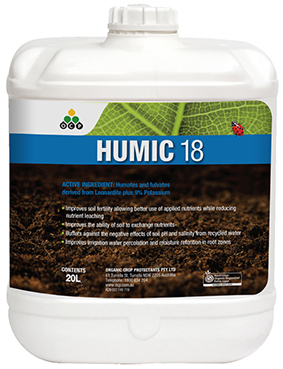 OCP HUMIC 18 is an excellent soruce of humic acids and potassium which aids in improving soil structure, cation exchange capacity, moisture absorbtion and water holding capacity. 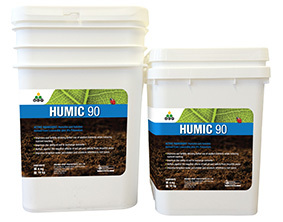 Humic acids are also very effective at buffering the soil against salts and other conditons that can impact on soil health and ultimately crop yields.